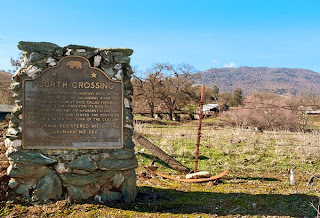 Having lived up in this area for a bunch of years, I would have guessed that 4th Crossing was a place where the pioneers crossed something on their fourth trip out here. Nope, got it all wrong. 4th Crossing was formally known as Foreman’s after its founder David Foreman. 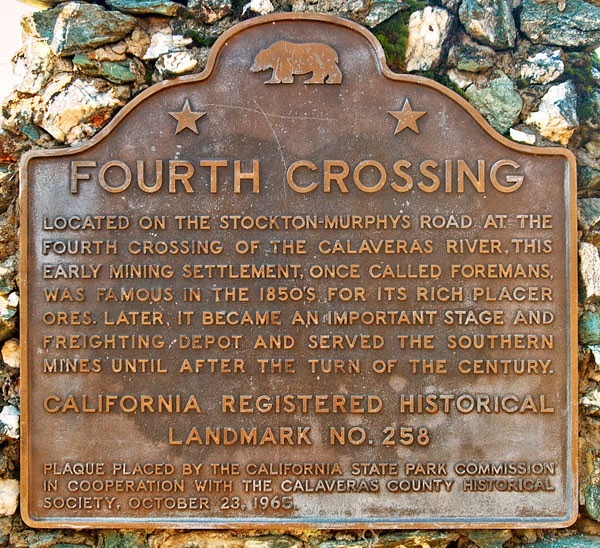 It is located on San Antonio Creek (even though the plaque says Calaveras River) is at the fourth river crossing on the Stockton-Murphy’s road. You probably don't know Murphy's, but it is the home of the Kautz (Like me) Ironstone Winery. And before you ask the question that everybody asks, nope, no relation. 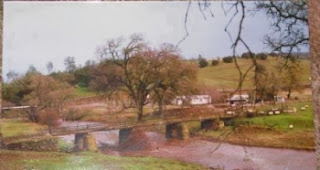 Foreman had established a ferry to cross the river, which they replaced with a toll bridge. The bridge is still standing to the west of the bridge that Hwy. 49 runs on. The town was famous in the 1850s for its rich placer ores (deposits of of gold in sand and gravel in modern or ancient stream beds), which were replaced by lode (hardrock mines) mining. After the gold ran out, the town continued to operate as an important stagecoach and freighting depot, serving the southern mines until after the turn of the 20th century. The county's first Justice Court was established here, complete with a Justice of the Peace. I pulled this picture off the Internet. In real life it doesn't look nearly as nice. Seems to lost in the "Keep the landmarks clean" department. I have two landmarks near me I might have to investigate. Anything dealing with the history of the country I am interested in, I am wondering if there thing left of the old town. Hi Bill. Most of the sites are on private property and are all but inaccessible. There are also lot of these places that are but a shell of a building, so you couldn't tell if you were in the right place or not. Very cool looking bridge, I saw it when I drove out there. I am going to have to take my wife for a drive out there soon. She would love it.